We are all witnessing the clear signals of a newly evolving experience economy. Organizations delivering superior customer experience are top of the list in winning the race and being rewarded by loyalty and advocacy. We invite you to witness a custom blend between market tendencies, trendsetters and expert views on innovative process management in CX. We translate the business app revolution into pure evolution for your business. Step in the game! 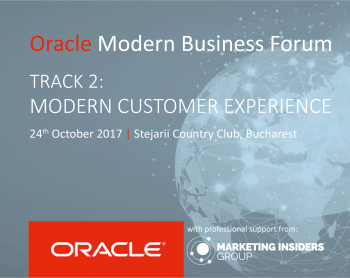 Oracle Modern Customer Experience is organized by Oracle with the professional support of Marketing Insiders Group. The business applications revolution we live – now taking advantage of cloud, advanced analytics, artificial intelligence/machine learning, Internet of Things and more - disrupts all business models, processes and decisions. But what are the new global business best practices and what is the real value you should expect for you in Finance, Human Resources, Operations, Procurement, Marketing, Sales, Service, Supply Chain, Manufacturing or IT? To answer these simple yet crucial questions, we have designed a dedicated agenda with inspiring thought-leadership keynotes, customer testimonials, apps innovations and journey sessions. You will also be able to directly engage and interact with Oracle experts and partners to get the strategic keys to successfully transform your business. You can check the agenda here. Customer Experience at the heart of your innovation strategy. Secret weapon to win the future. Whether you are already an Oracle customer or not yet, register now to understand the new business realities imposed to the C-Suite and the value cloud business applications can bring to drive a fast yet highly differentiating business transformation.